We plan our trips to visit school-going friends on weekends and homeschooling ones during the week. Today we’ve parked outside the house of our good friends on the Sunshine Coast. Nigel invites Dell to watch while he feeds the fish. I know it’s important for our girls to continue to see how a Daddy interacts with his family. Most of the men I know are the husbands of my girlfriends, and I’m delighted when the girls respond to fatherly attention within the families we visit. I love hanging out with Melinda and Nigel. They’re a couple who have space in their relationship to include others. They frequently have other people staying over, and we’re not the only ones bunking down here tonight. 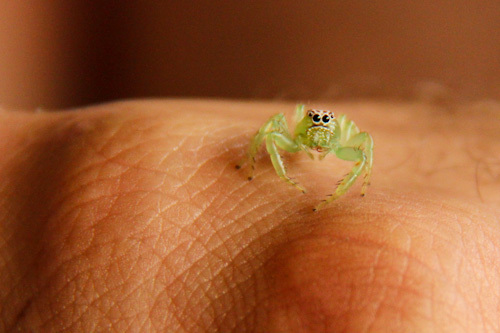 Nigel finds this friendly monkey spider jumping around the back yard. I can’t fault her logic, although I am constantly assessing the situation to see if her (or her sisters’) preferences change. There may come a time in the future where we need to settle down for someone’s sake, but until then, we’ll keep on moving! Asher, Calista and Dell enjoy several baths — the heat means that the water is cool, and for them this is as good as a pool! Mel and Nigel spend a lot of time together working on their online ventures. 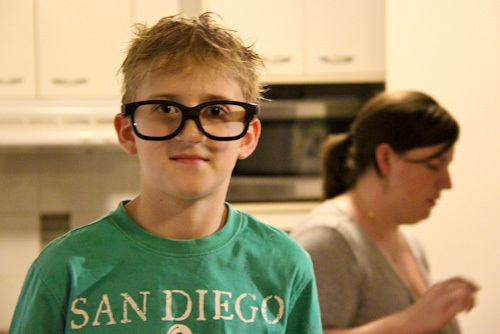 Zeke has modified a pair of 3D glasses to give himself a more mature look. 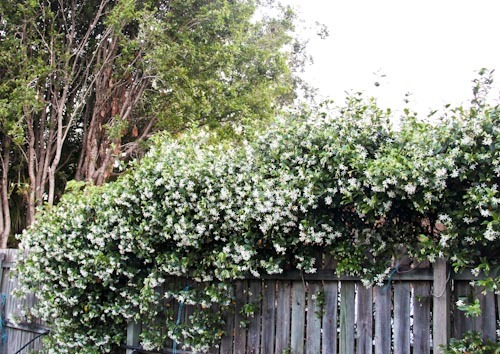 A jasmine vine heavy with blossoms tops the fence near where we park The Gifted Gypsy, and the gorgeous scent wafts through our bus all night. I love being enveloped in a nice smell, although I stopped wearing perfume and deodorant several years ago. Instead, I light incense when I tidy up the bus. At this stop, we don’t need the incense — the jasmine’s scent is pervasive and still a bit elusive. We breathe deeply of the natural perfume as we fall asleep in the big bed. It’s good to be on the road, it’s good to be among friends.